We are located in Asuka village in the center of Nara prefecture, about 40 minutes by train from Nara city. Kyoto and Osaka can be reached in about an hour from Kashiharajingu-mae, the nearest train station. Asuka thrived as a central city in the 6th century so there are many historical sites to visit. Beside its historical importance you can also enjoy the unspoiled rural scenery of the farming village it is today. Unlike big cities, Asuka still boasts the traditional Japanese satoyama landscape where people and nature coexist harmoniously. As Asuka lies in the center of Nara prefecture it is located conveniently for sightseeing in Nara city, Sakurai and Yoshino lying further to the south. Koya-san can also be reached in about two hours by train. Kansai International Airport is one hour away by limousine bus from Yamato Yagi station, 10 minutes from Kashiharajingu-mae. 2).We can provide dinner ( 1000 ~). Please reserve beforehand. 3).1 day advance notice for free cancellation. Lovely and clean. Perfect location for exploring Asuka. Quiet and relaxing guesthouse. Asuka is a very small Japanese town with a lot of historical significance. It was my favorite stop on my entire trip. Admittedly, you won't find a lot in the way of amenities in the town itself, which is why I was so pleasantly surprised to find a hostel like Asuka Guesthouse. It had a fantastic balance of modern and classic Japanese style, the staff was warm and welcoming, and their optional dinners and breakfasts were great. It was clean and had everything I needed. Would recommend. 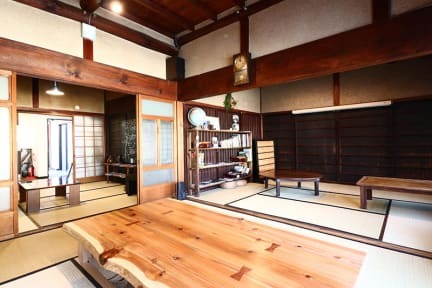 I have been living in Japan for almost a year and this was one of my favourite places to stay and visit. I've been touring the nation as a travel writer and I rarely come across hostel-style accomodation/service that blows me away. 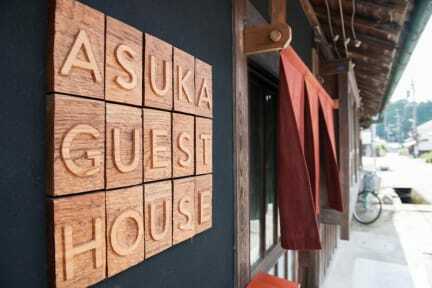 I stayed 4 nights and highly recommend you do the same in order to fully experience Asuka and surrounding areas. Seeped with fascinating history and possessing stunning beauty, the natural and man-made attractions are breathtaking. The dinners are oiishi! I would say that this this is the best hostel I have stayed and I have been in many properties in quite some countries. This place is outstanding, is not common to find places with such quality. The staff is impossible to be better, generous, friendly and extremely helpful. The place is incredible clean and beautiful, extremely comfortable. Any word I can say will be short. Thanks for a great stay!! Very clean and nice common area, but the 7-person dorm would be much more comfortable with only 6 beds + shelves or a table. There is absolutely nowhere to sit or put your stuff but the floor, and even the floor is full if there are 7 people. You can't sit on the beds because of the sides. Please remove the sides. We are not babies. We will not fall out of bed. And even if we do, it's only 20 cm! The rest of the hostel is very nice! Nice hostel in a great area. The staff are very nice and helpful and everything is very clean. Downsides: the bed is quite hard as there is only a thin mattress on wood. Showers are not available between 10am and 4pm Im assuming for cleaning. Finally there is not a lot of space in the 10 bed dorm. The fact that luggage cannot be placed under the bed makes this worse since we have to hop around each others luggage. If the dorm was full this would be a problem.